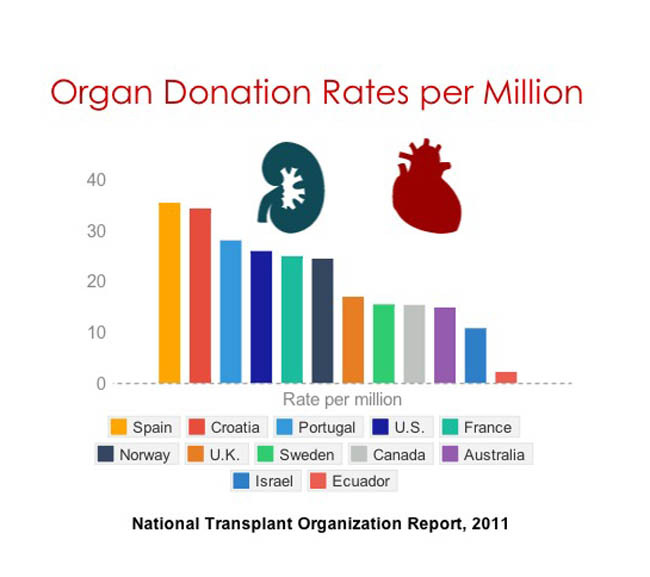 Which country has the highest organ donation rates? In the United States, there are currently 122,592 people waiting for an organ. According to Organdoner.gov, the government gateway for information on donation, 18 people die in the United States each day waiting for an organ. The United States stands midway among developed nations in donation rates with around 26 donors per million people. Spain has been the acknowledged leader in donations for number of years with 35.3 donors per million. Some of the difference in rates is due to an opt-out versus opt-in policy. In Spain you are considered a donor unless you make the effort to opt out of the donation system. In the U.S., people must choose, usually during the process of getting a driver’s license, to participate in the donation program. However, in Spain and countries who use similar programs, the medical establishment still seeks permission from family members routinely. Our PBS NewsHour Weekend piece illustrates some the of the steps Australia is taking to make organ donation a more common choice. Australia has created sophisticated systems to enable tissue matches. And, a new $1.3 million initiative reimburses employers for giving donors time off work to recuperate from the major surgery involved with organ donation.